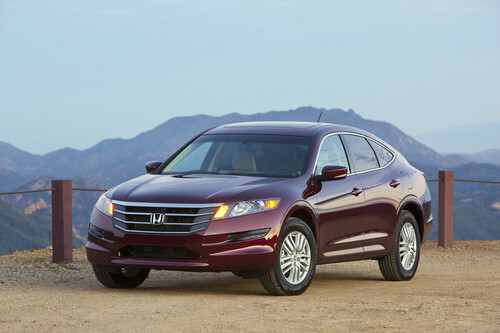 Although it is considered a full-size crossover SUV, the Honda Crosstour is really a large, sleek wagon. The Crosstour’s versatility and unique design was a hit with customers when it was introduced just five years ago, and the sub $30,000 asking price helped attract entry-level crossover customers to the Honda brand. The Honda Crosstour was initially introduced in 2009 to be sold as a 2010 model, but the Japanese automaker did not set up an elaborate display at an auto show to unveil its new vehicle. Instead, the Honda Crosstour made its debut on Facebook. The Crosstour is essentially a hatchback, or extended wagon variant of the Accord, and was initially branded the “Accord Crosstour,” but Honda opted to drop the Accord name, as the new model was unique enough to warrant distinction. Although the Crosstour technically remains in its first generation, Honda did recently give the crossover an extensive facelift. In addition to refreshed interior and exterior styling, Honda also dropped the price tag of the Crosstour by about $500 to attract new buyers. Under the hood, Honda has added a fuel-efficient Earth Dreams V6, which enabled the Crosstour to break through the 30 mpg highway threshold. The Crosstour began arriving at dealerships in November of 2009, and in less than two months, Honda had sold over 2,500 Crosstours. That made 2010 the Crosstour’s first full year of sales, and Honda sold 28,851 units, which remains the best individual sales year for the Crosstour.